West Springfield High School is a relatively large high school, approximately 2250 students, but maintains the feel of a genuine "community school." Our transfer rate is about half of the FCPS average, and over 20% of our staff are WSHS graduates or currently have their own children enrolled at WSHS. Our school’s purpose is to create a learning environment conducive to developing responsible members of society who are prepared to meet the challenges of the 21st century. West Springfield High School is a W!$e Blue Star and U.S. News Gold Medal School. Our academic programs offer a rich array of intervention and enrichment opportunities, from basic skills to psychology to guitar to honors courses and extensive Advanced Placement coursework. 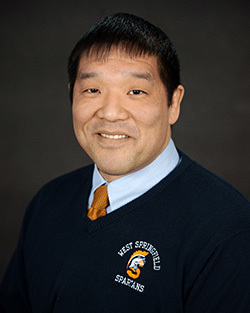 The Response to Intervention protocol, newly designed Advisory and Spartan Time, student-led Writing Center, and support programs (ASAP, ISIP, Spartan 101, Spartan Zone, Success Prep, and Advanced Academic Seminars) embody West Springfield’s commitment to student success. The staff at West Springfield High School is fully committed to developing professional learning communities. Our teacher leaders created and routinely revise a WSHS Manual for Collaborative Learning Teams, which serves as a guide for the work and growth of curriculum teams. At West Springfield High School it’s “not ‘your’ students, not ‘my’ students,” it’s “‘our’ students.” The innovative Response to Intervention protocol, also developed by WSHS teachers, incrementally increases the support for struggling students. This mission is supported by a nationally recognized Student Services department. We emphasize academic achievement while also acknowledging the importance of a broad spectrum of learning experiences. West Springfield High School is proud of recent extracurricular and co-curricular achievements: One Act Play State Champions; School Newspaper State Champions; superior district, region, area, and state ratings for chorus, band, and orchestra; local, state, and national DECA awards; art and writing recognition; award-winning yearbook and literary magazine; nationally recognized dance team; district champions in cheerleading and Girls Swim and Dive; and the 2013 Girls Cross Country Conference Champions. The work of the faculty and staff is supported by the WSHS Parent, Teacher, Student Association (PTSA), a variety of booster organizations, and Parent Liaisons. The community works together to make West Springfield High School a better place for students. Attendance Area This school is part of Region 4 and the West Springfield High Pyramid. Enter your street address in the boundary locator to determine which schools your student should attend.